I should start off by saying that I don't own very many pairs of pants. Off the top of my head I can only recall four pairs — two pairs of black denim (one regular rise and one high rise), an orange pair of regular rise grazers, and this pair. I bought these at Urban Outfitters on State Street in Chicago. Before Geoff and I went on our trip I had spied these in what was the catalogue and the time and lusted over them badly. When I saw them on the denim bar I had to have them! I haven't worn them in a minute since it has been so warm, so I'm starting to worry that they may be a size too large for me now. Regardless, I love them. 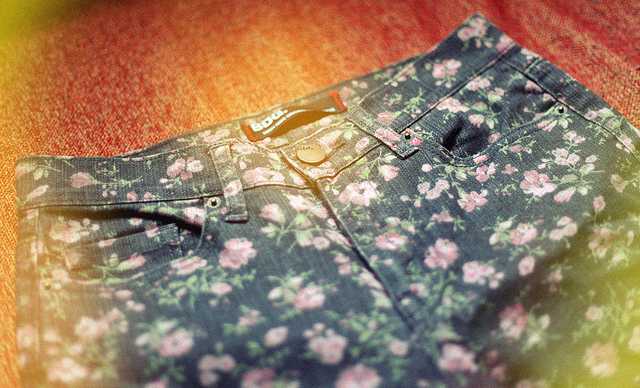 I wish that I could find them again so I could make a pair into shorts. @Heidi Jo — I don't mind! I love that you're reading and interacting!